The “Route Messages Via” option defines the protocol that will be used for routing the MMS message. Messages can be routed to an external host using the MM7, MM4, MM1 or EAIF protocols. 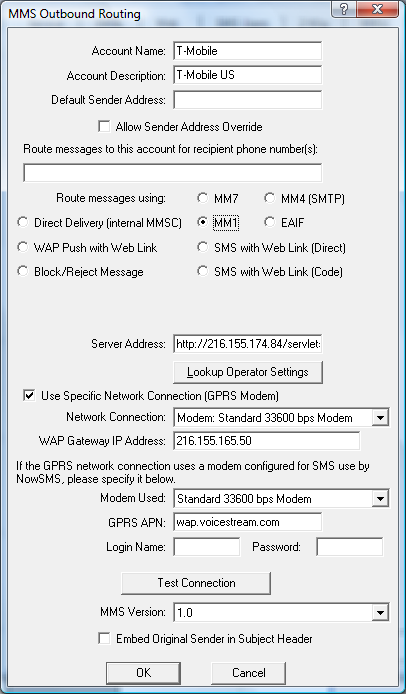 Other options for message routing include “Direct Delivery” via the gateway’s internal MMSC, or an option for the MMS to be converted into a Multimedia WAP Push message to be received by the WAP client on the recipient phone instead of the MMS client. For MM1 connections, the “Server Address” field should contain a URL for posting to the MMSC. (The “http://” portion of the address is optional.) For example, http://192.168.1.1:8080/mm1. Note that when you are using MM1 to connect with an operator MMSC over GRPS, this “Server address” is the “MMS Server URL” that would normally be configured on a mobile phone to connect with the operator MMSC. If the MMS message content needs to be sent over a specific network connection, such as a GPRS modem, check the “Use Specific Network Connection (GPRS Modem)” checkbox. b.) “Dial-up:” refers to a dial-up networking connection defined on the current PC. This setting can be used if you have advanced requirements and wish to create a custom dial-up networking profile. c.) “Network:” refers to a particular network interface card installed in the PC. Some PC card GPRS modems, such as the Sierra Wireless Aircard 750 provide GPRS access via a network driver interface. To tell NowSMS to use that specific network driver for connecting to the MMSC, select the named “Network:” driver. The “WAP Gateway IP Address” field should contain the IP address of the operator WAP gateway which will act as a proxy for connections to the MMSC. If the gateway uses WAP2/HTTP instead of WSP, prefix the address with “http://”, using the format “http://ip.address:port”. For most GSM/GPRS modems, it is not possible for the Now SMS & MMS Gateway to connect to the modem to send/receive SMS messages as the same time as a GPRS connection is active (Network Connection type = “Modem:” or “Dial-up:”). For these situations, the “Modem Used” setting should specify the name of a modem that is used by the Dial-up networking profile. If the Now SMS & MMS Gateway is using the modem to send/receive SMS messages, it will automatically release the modem when it needs to initiate a GPRS connection, otherwise the GPRS connection will not be able to be properly established. The “GPRS APN” field specifies the GPRS Access Point Name (APN) to be accessed for connecting to the MMSC. This setting is operator dependent, and it may be advisable to check the MMS configuration settings on a working mobile phone to determine the correct settings. Note that your mobile operator possibly has multiple GPRS APNs and multiple WAP gateways, and you need the settings that are appropriate for MMS, not for WAP browsing or general internet connectivity. Note that this setting is only available when using a Network Connection of type “Modem:”. For other connection types, the GPRS APN must be configured for the connection using some configuration means external to NowSMS. The “Login Name” and “Password” parameters specify a username and password to be used for connecting to the GPRS network. The “Test Connection” dialog verifies that the Now SMS & MMS Gateway can make a TCP/IP connection to the specified “Server Address”. Or, when an MM1 connection is used with a dial-up connection (“Use Specific Network Connection (GPRS Modem)”), the gateway will initiate a network connection to the specified profile, and that it can make a connection to the specified WAP gateway over the connection, and the “Server Address” is not tested at this time. “MMS Version” specifies the version number of the OMA MMS Encapsulation Protocol to use when communicating with the operator MMSC. Note that support for read receipts requires version 1.2. The “Embed Original Sender in Subject Header” is a special setting that can be used when NowSMS is operating as an E-Mail to MMS gateway with MMS messages being sent via a GPRS modem. When this option is checked, the original message sender is preserved in the subject header of the MMS message, so that if a reply is received back from the message recipient, NowSMS can route the reply to the original sender. For more information on this type of configuration, see E-Mail to SMS/MMS Connectivity.